Is there a better alternative to Today in NM? Is Today in NM really the best app in Miscellaneous category? Will Today in NM work good on macOS 10.13.4? 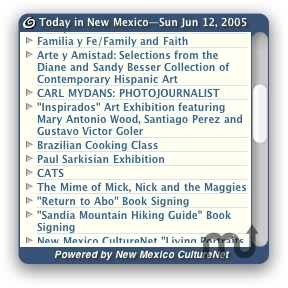 Today in NM brings you arts- and culture-related events from around New Mexico to your desktop by tapping New Mexico CultureNet's RSS feed of the same name. Events load automatically and refresh once a day without intervention. Click on the arrows to see event descriptions. Click on the title of an event to see more detail about it on the New Mexico CultureNet Web site. Today in NM needs a review. Be the first to review this app and get the discussion started! Today in NM needs a rating. Be the first to rate this app and get the discussion started!